I was biking up to campus today in order to buy season tickets for Shakespeare Santa Cruz (I meant to do it months ago, but I could never figure out exactly what our summer schedule was). 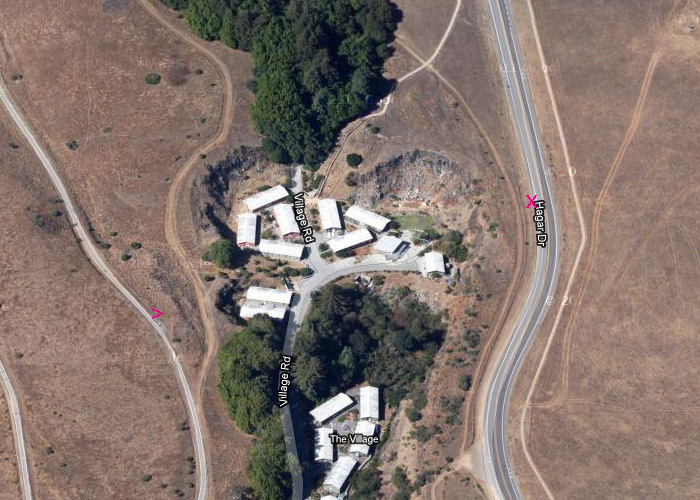 On the way up the bike path I noticed a fire truck and police car on Hagar, on the other side of the Lower Quarry. I stopped on the quarry overlook to chat with another bicyclist who was there. She reported that the accident involved a bicyclist, but that she had not seen it and did not know whether a car was involved or not. The "x" marks the approximate spot on Hagar that the bicyclist was transported from, and the ">" marks the overlook on the opposite side of the quarry, about 200 m away. It is somewhat unusual to have bike accidents on Hagar, as it has a pretty good wide bike lane (much safer than the bike path downhill). Indeed, the first responders had shown up first on the bike path, since that is by far the more common spot when they get a 911 call for a bicyclist injured on the Great Meadow. While we were there, and ambulance arrived and transported the bicyclist to the hospital. I hope that whoever it is turns out to be ok. The other bicyclist thought it was a good sign that they were using an ambulance rather than a helicopter—if the paramedics had thought the injuries were severe, they were more likely to call for a helicopter to get the injured person to a trauma center over the hill. I should have known better than to send the PC board to fab before I wrote the software. That’s precisely the sort of optimistic thinking I chide my students for. There are all sorts of design errors that can be uncovered when you work out the details of how to use the hardware. In my case, the motor functionality of the board all looks ok (so far), but the extra servo functionality is somewhat messed up, because I had not really understood how servos are controlled and how the Arduino servo library uses pins. I “knew” that servos used pulse width to control position, but I had not bothered to look into the details or think about exactly what that meant—I just assumed that you had to use the PWM pins for the purpose. Wrong! If I’d ever actually used a servo with the Arduino, I would have known better. So putting servo control on the PWM pins is precisely the wrong choice of pins for maximum flexibility. The hexmotor rev1.3 board has more or less the capabilities I thought it had (I can do up to 6 servos or up to 6 motors, and I can trade off servos for PWM control of motors, though I always have to give up PWM control of motors 4 and 5 to get any servos). The initial application of the hexmotor board called for 4 fully PWM-controlled motors and 2 extra controls that could be motors or servos. We can still do that, though we have a choice of 2 PWM-controlled motors or 2 servos and 2 forward/backward/brake (not PWM control), and can’t mix a servo with a 5th PWM-control motor. But there is no reason to limit the board the way I did. With slightly different wiring I could have simultaneously allowed 4 PWM-controlled motors, 2 forward/backward/brake motors, and 5 servos, with the main limitation being the power to the servos (due to the 1.5A limit of the switching regulator). Three extra servo outputs could be really handy! I also did not think about making the board compatible with the Arduino Mega board. The current design does not use the Arduino Mega’s extra pins, which is no big deal, but it also blocks access to those pins, which could be a problem. Furthermore, I did not look at what pins the Arduino Mega provides PWM on, nor which it gives up for the Servo library. Incidentally, I was frustrated in looking on the Arduino site for the pin mapping of the Arduino Mega boards—they’d hidden that essential information behind a password (for no discernible reason). I finally found the Mega pinout info on the forums, where someone frustrated by the inaccessibility of the pin mapping page had re-created it from other documentation. It turns out that all the digital pins 2 through 13 can be used for PWM on the Mega, so any redesign I do on the board would have at least as much functionality on the Mega as on the standard Arduino. I will have to be careful to put in conditionals for the pins in the software, though, as some of the pins are mapped from different ports on the Mega. Redesigning the board to pass through the Arduino Mega pins would be a pain, as the pins take up three sides of the 1.825″×4″ footprint of the Mega board, and the remaining side is where the USB and power connectors are, so through-hole components can’t be mounted there. I don’t think I can fit in all the TLE-5206-2 chips and screw terminals for the 12v power and motors and stay below the Eagle 8cm×10cm board size limit if I have to put in connectors for all the Arduino Mega pins. I won’t be able to stack boards above the motor board anyway, as the electrolytic capacitors I’ve designed in to clean up the power are very tall (2cm), as are the TLE-2506-2 chips: particularly if I put on heatsinks. I’ve bought a strip of 1/8″ thick, 3/4″ wide aluminum bar stock for a heatsink—I plan to drill 6 holes in it to bolt the TLE-5206-2 chips to. It won’t matter if the bar connects the chips electrically, as they all have a common ground connection anyway. I think that I’ll populate one rev 1.3 board with only 4 TLE-5206-2 chips, the minimum for the robotics club to be able to experiment with their underwater vehicle, and see how it works before making a new set of boards with full functionality. Details about the event are on the meetup web page—I’ve already committed to going, despite the $5 cost. So far, it looks like they will not be getting the sort of expensive shop equipment that places like TechShop (over the hill) have, but lower-priced stuff suitable for a home shop. I hope this means that they’ll be a lot cheaper than TechShop, which is $100 a month. The American Chemical Society has started a series of free on-line videos about how to publish your research: Publishing Your Research 101 (ACS Publications). I’d like to be able to tell you that I’ve watched the videos and highly recommend them, but I can’t. I hate videos as an instructional format and don’t have the patience to watch even a 6-minute one. I could not bring myself to click on the video links even for the purpose of reviewing the video. Strangely, I have no trouble watching a full Mythbusters episode on DVD with my family, nor sitting through more-than-hour-long live lectures, so neither video alone nor lecturing alone is the problem. I’m not sure why I find the combination so irritating. Still, the concept is a good one, and I realize that my reaction to video instruction is highly idiosyncratic, so I thought it worthwhile passing on the information to those not on the American Chemical Society spam list. I suspect that their target audience was postdocs and junior faculty, but grad students and advanced undergrads would probably benefit as much.